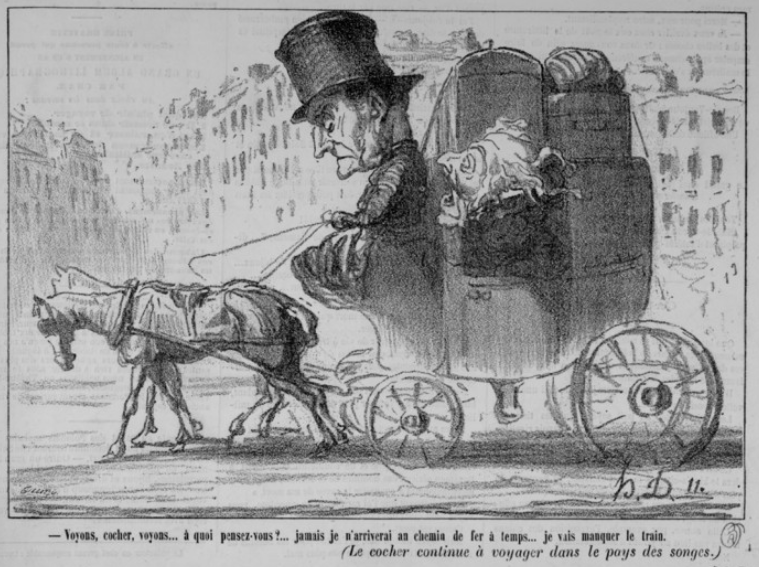 A good portion of the current cultural image of the cabdriver developed in the Nineteenth Century. 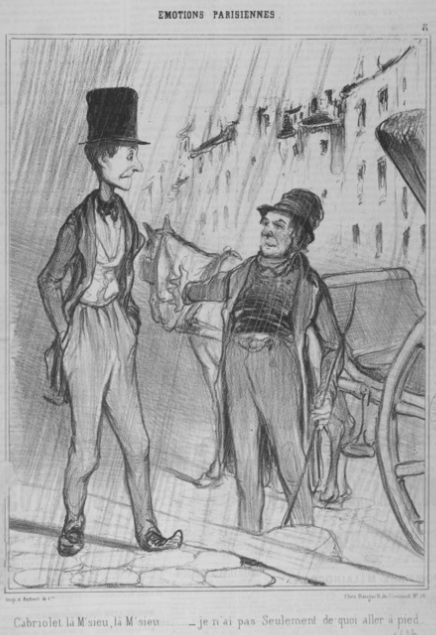 Hack and cab drivers were commonly featured in the physiologies – illustrated lists of common urban personalities or character types, a sort of “Who Are The People In Your Neighborhood?” meant to reassure readers that the quickly changing city was still legible. 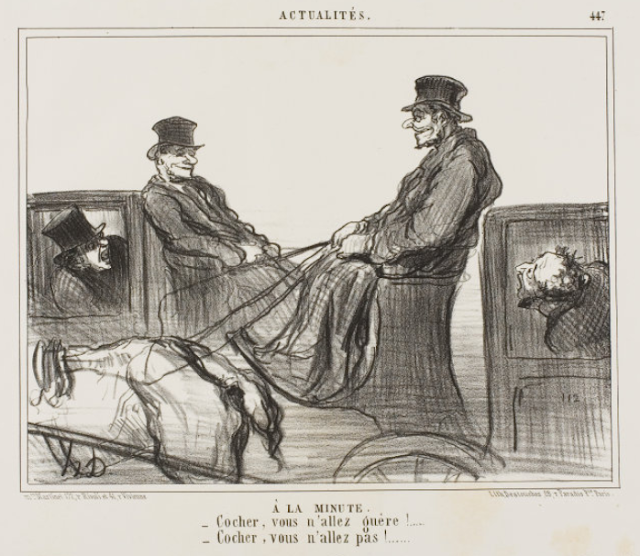 Daumier was very conscious of what today might be called the micropolitics of everyday life. 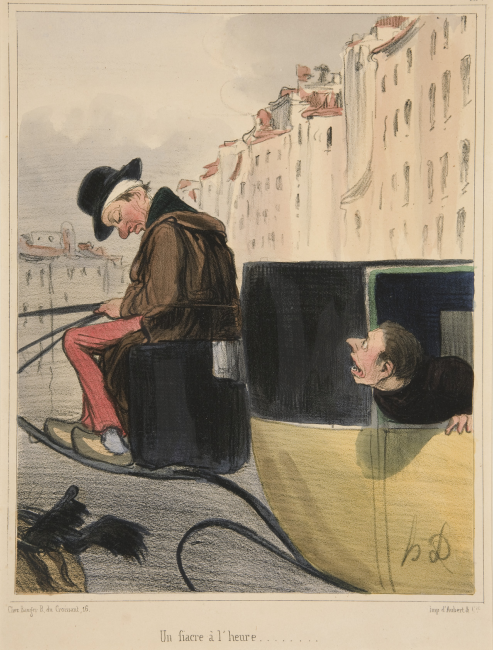 He was also particularly observant of the indignities and hidden injustices of transportation—most famously, in his depictions of third class railway passengers, but also the long-suffering riders of omnibuses and stage coaches, and even those travelling by boat on the Seine. 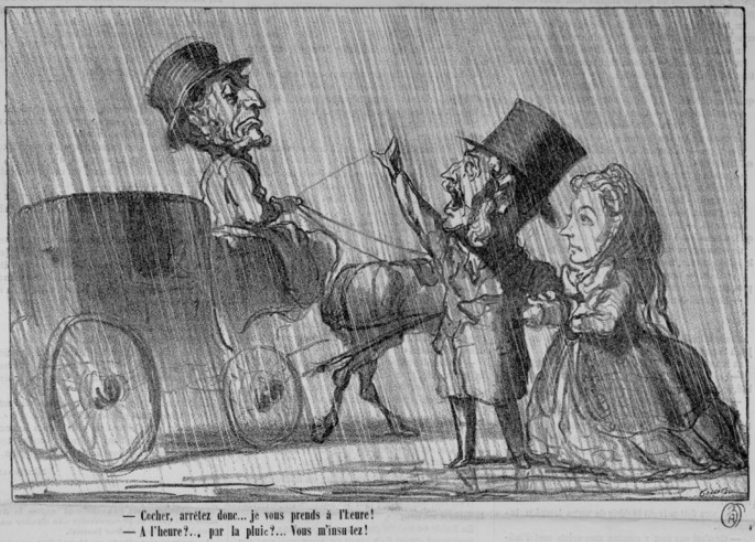 He also repeatedly returned to the subject of Parisian fiacres (hacks) and cabriolets (cabs), and the interactions between their drivers and passengers. 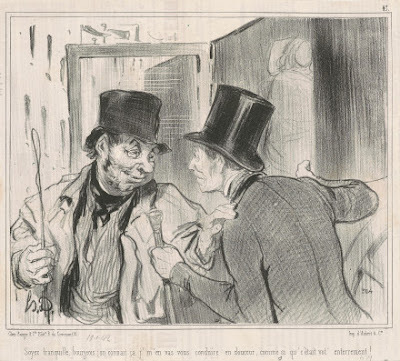 In Daumier’s prints, the hackmen are selfish, wily, and unkempt—precisely as they appeared in the work of his contemporaries. 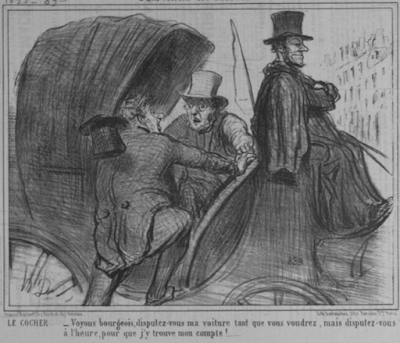 However, as a champion of the poor and oppressed, Daumier was more sympathetic to workers, including hackdrivers, than many of the other physiologues of his time. The bottom line for Daumier, nevertheless, is that no one gets off easy, and most often, both drivers and passengers come across as ridiculous figures. Driver: Where to, bourgeois? Shall it be by the hour or by the trip? Passenger: I will show you... Rue St. Honoré. Driver: Excuse me then: by the hour! Many of Daumier's cab cartoons focus on a common source of contention between drivers and passengers: the method of fare calculation. Decades before the invention of the taximeter, Parisian cabs charged either a flat rate by the trip, or a variable fare based on time. In the above comic, a savvy driver deals effectively with a drunk, disoriented customer. Seeing that the passenger is uncertain of the correct address, the driver declares it a time-based fare, to ensure that he will be paid for the inevitable time spent searching for the actual destination. Like almost all of Daumier’s hackdrivers, the driver here is holding a whip, wearing an overcoat, and sporting a tall plug hat which has become warped and misshapen through long exposure to the elements. This driver waits stoically for two disputing passengers to duke it out over his cab, while insisting that he will be paid for the wasted time. Since the per-hour rate was slightly higher than the per-trip rate, it was often advantageous for drivers to give rides by time rather than by trip—leading in turn to suspicions by passengers that drivers were driving intentionally slowly, in order to “run up the fare.” Daumier illustrates these concerns with these two excruciatingly slow drivers, grinning like Cheshire cats at the complaints of the helpless businessmen trapped in their vehicles. 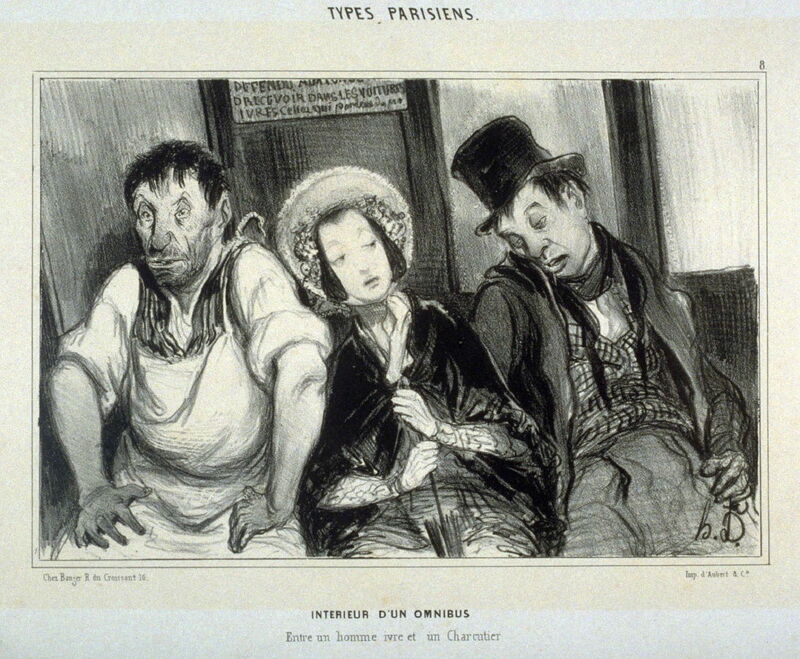 Less conspiratorially, in this illustration the driver has simply fallen asleep through exhaustion, to the consternation of his passenger, who is paying by the hour. The yellow body and black top was typical of Paris cabs in this era. "Driver, stop! I will pay by the hour!" "By the hour? In the rain? You insult me!" 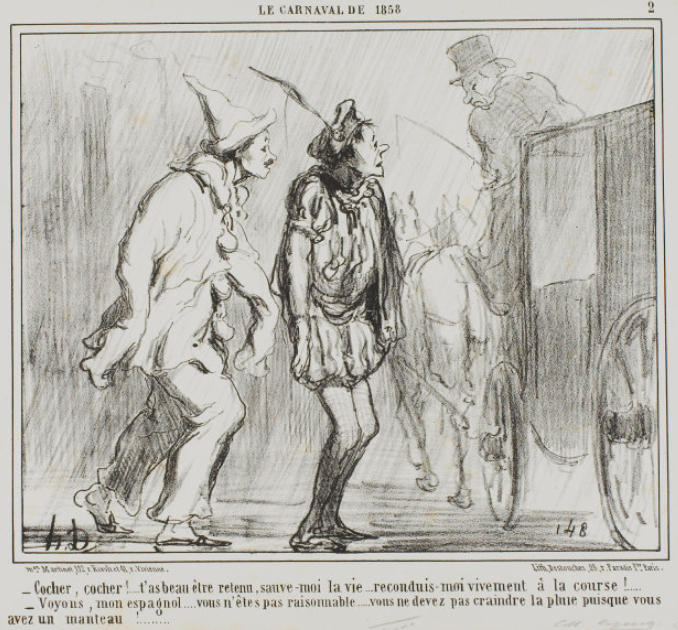 Then as now, rain would bring a reversal of power, and cabdrivers, instead of having to search for passengers, took advantage of increased demand to pick and choose the most desirable fares. 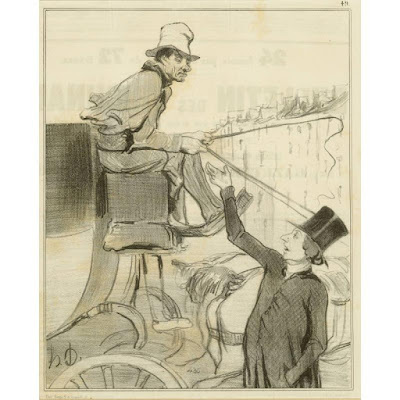 Here the gentleman hailer offers to pay the driver the higher per-hour rate in order to secure a ride. The driver pretends to be insulted by this pandering—more likely, he hopes to make more money at the per-trip rate than at the per-hour rate, while the rain lasts. Then again, these rain-soaked Commedia dell'arte performers dressed as Scaramouche (?) 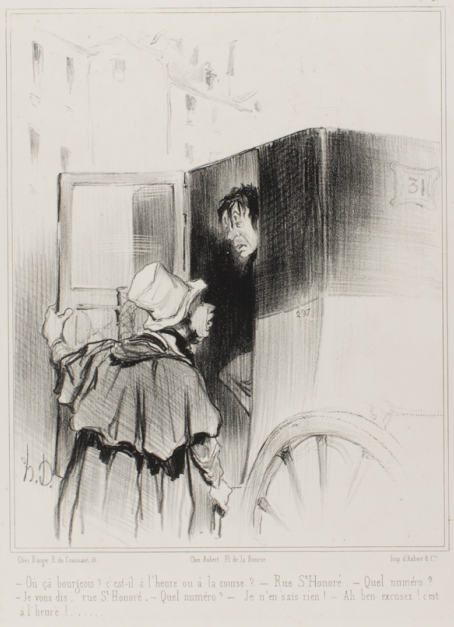 and Pierrot offer to to pay by the trip; but the driver refuses, perhaps because of their destination, or perhaps because he knows actors are likely to be broke, and therefore unlikely to tip well. 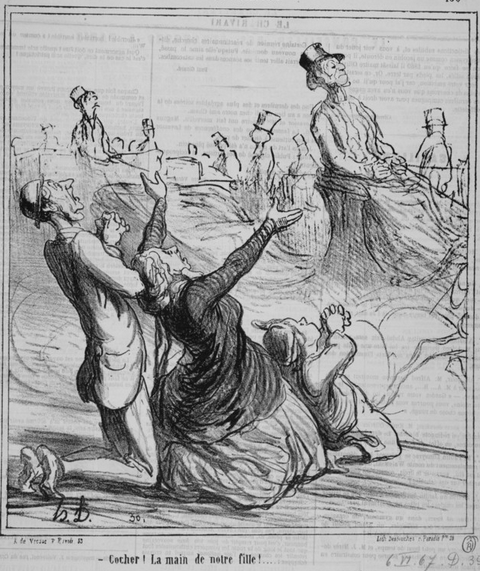 Desperate for a cab, a family offers their daughter's hand in marriage to the driver who will stop for them—to no avail. 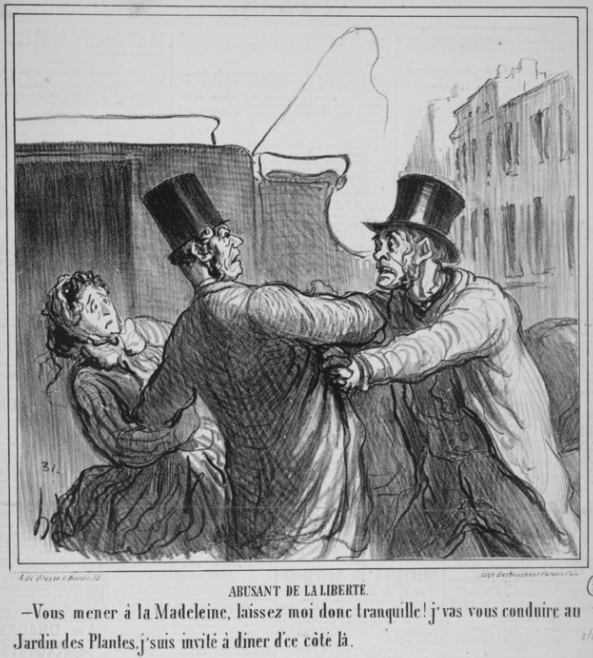 Daumier may be intentionally ambiguous about just who is “abusing the liberty” of whom. The bourgeois couple, who have apparently been pestering the off-duty fiacre driver with requests for a ride? Or the driver, who decides to take them, not to their destination, but to a place more convenient for him? 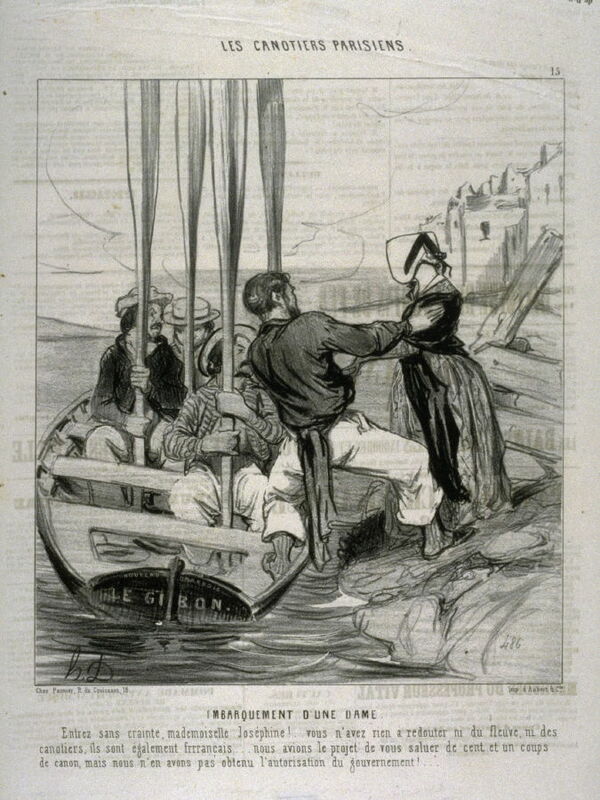 Like expensive clothes, riding in hacks was a status symbol of the rich, but was open to appropriation by upwardly aspiring members of the lower classes. 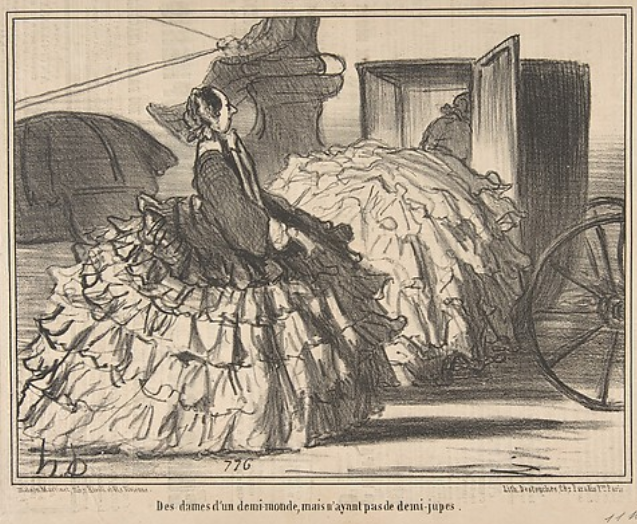 Here, Daumier pokes fun at the pretentions of prostitutes who mimic both the clothes and the riding habits of the nobility.